Spalding Basketball Backboard and Rim Combo model 80602R - 44 inch Fan-Shaped Eco-Composite Backboard and a Standard Rim. Spalding Basketball Backboards provide an excellent solution when either replacing a current broken backboard or when setting up your court for the first time. The eco-composite material used on the 80602R provides a better longevity when compared with acrylic or polycarbonate backboards. The system also comes with a Standard rim. 44 inch wide eco-composite material. Eco-composite provides a superior strength when compared to acrylic. Comes with a Standard rim. Rim comes with an all-weather net. Compatible mounting brackets 8406SR, 8839S, and 88300S (not compatible with any other bracket model). Height adjustable from 7.5 ft to 10 ft. in infinite increments when mounted to the 8839s bracket. Product weight is about 19.00 lbs. Product packaging dimensions: 44.25" x 4.18" x 29.00". This is very lightweight. Its completely plastic. The colors and pictures on the backboard are definitely kid approved. The rim is rock solid though. It is not plastic. Price is good. Q: is thus backboard compatible with the Lifetime quick adjust conversion kit? 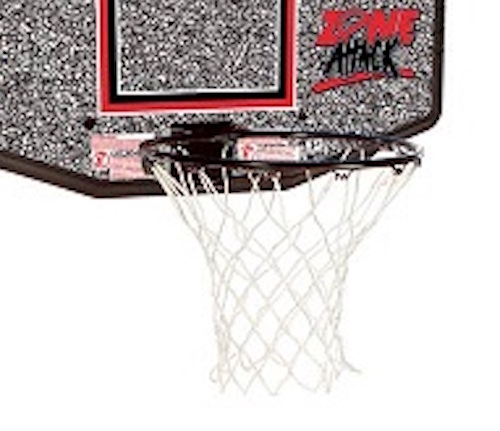 A: Spalding backboard and rhythms are not compatible with any other brand of brackets other than the Spalding brand. Please take a look at the Spalding brackets and each of them has a chart that tells you which backboards are and are not compatible. Feel free to contact us with any other questions. 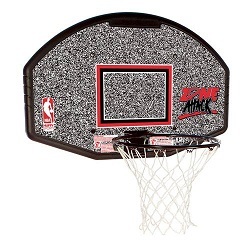 Q: does the backboard come with pre-drilled holes or may I drill them in to suit my 30 year old bracket? A: Unfortunately Spalding basketball backboard are not always made to the same size connection. I am not sure if it will work on an older bracket. If you call 1 (855) 253-4533 they should be able to tell you. Q: Can I buy just the backboard if I already have a rim? A: Unfortunately, we do not sell the backboard alone. It is bundled with this rim. Q: Does this fit regulation size basketballs or just a small mini 7 inch balls? A: It is designed for regulation size basketballs (18 inch) or smaller. In other words, if it's any size basketball from regulation, Junior size, to the mini basketballs. Fast Shipping: Orders for the 80602 Backboard and Rim Combo generally leave the warehouse the next business day. Dimensions: 46" x 32" x 7"